Have you ever gone to bed with a pit of dread in your stomach? That was me last night. Just before I closed my laptop, I discovered an enormous mistake I’d made with some work stuff. It involves customers, and the potential of letting some people down. I went to bed with a tight chest, short breath, and a stomach made of lead. Fortunately, I love reading fiction, and last night it saved me from the dread. Also fortunately, I sleep like a rock most nights. Coupled, these traits meant I was able to gradually soften the dread-stomach, loosen my chest, and calm my breathing, before going to sleep. I realised, as I slowed down, that nothing further could be done, and I needed to relax and do my best tomorrow. Have you ever woken up, and enjoyed a mere split-second of ignorant bliss before the memories of yesterday’s mistakes come rushing back to you? I sure have. Today, I am grateful to say that didn’t happen. I woke feeling refreshed, relaxed, and inspired to get creating again. It got me thinking how amazing each new day is. Every sunrise, every single morning, we get an opportunity to reset and go again. This follows directly from yesterday’s IQ, and it’s a beautiful way to regard each morning. Blank canvas, fresh opportunity to get up and do something positive. On those mornings when I wake up feeling rubbish, and the dark mood tends to linger a while, I’ve noticed that one of the fastest ways for me to make myself feel good is to make someone else feel good. It might be a friendly smile, a bit of light-hearted banter with the person behind the cash register at the supermarket, or a random conversation with a stranger in the street. By working to make someone else’s day just that little bit brighter, we lift ourselves up and brighten our own day. Case in point: me writing these IQs again. It’s my way of ensuring I focus on something positive, and also that I brighten someone else’s day, every day. 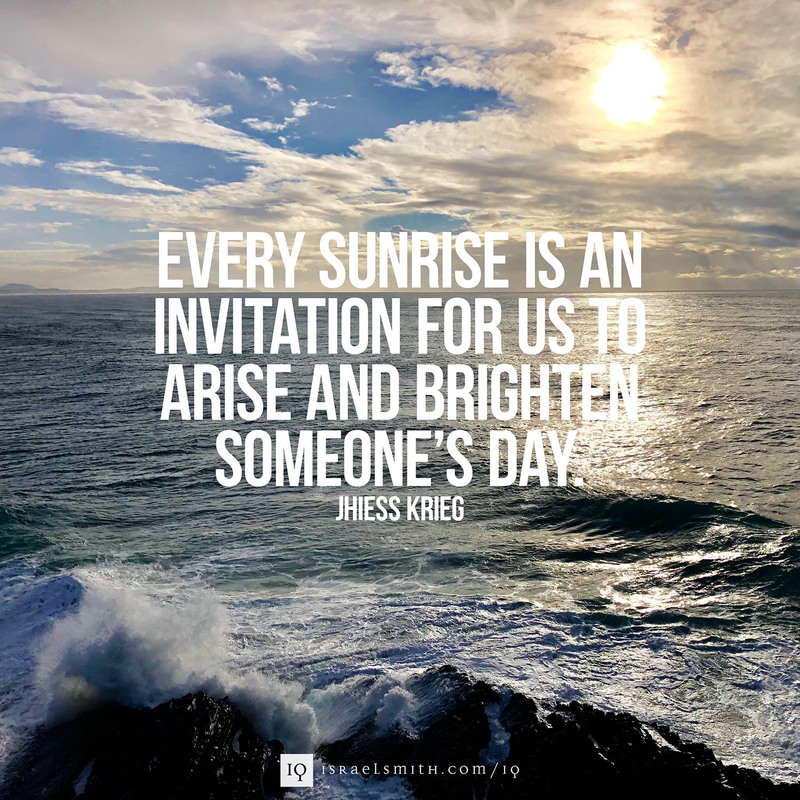 What can you do today to brighten someone’s day?